A group of year four pupils from Formentera's secondary school IES Marc Ferrer paid a visit today to the island's dependent care or “Day Centre” (Centre de Dia) for a close-up look at how the facility works and to share experiences with both employees and islanders at the centre. Year one and two students of the batxiller programme made a similar trip last Monday, and tomorrow the other year four group will follow suit. 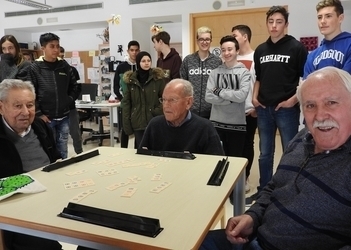 The visits are meant to educate older highschoolers about how the Centre de Dia works so they can get a sense of the employment opportunities available—“here and at the future home for the aged”, said director Marta Uriarte. “We want our visitors to come away aware that the two facilities are good places to work”. The visits form part of the events organised for Children's Day. In 2015, local school children visited the centre as part of a programme created to promote cross-generational encounters. According to CiF social welfare and youth councillor Vanessa Parellada, school visits from Centre de Dia regulars came next. This year, the cross-generational experience has fused with job preparation—particularly because, as Parellada pointed out, “the day centre now, and the seniors' assisted living residence in the future, are strong generators of employment”. “It seemed like a great idea to get older students from the high school here in person to see what it's all about and what kind of jobs are available”. Thirty-six islanders use the dependent care facility today (26 seniors and 10 individuals with varying levels of dependency) plus another five participants in a programme to boost individual autonomy. The 19-person support team includes eight social health workers, with at least another eight required when the new assisted living facility opens.